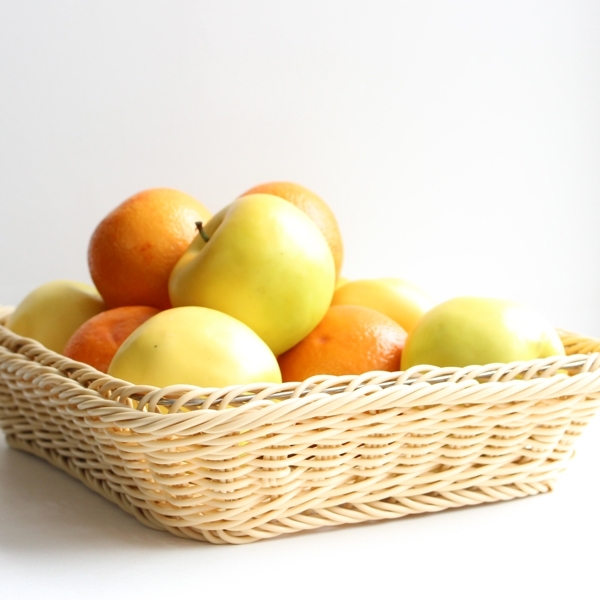 These wicker style baskets are made of synthetic polypropylene that looks and feels just like rattan. Use separately or on our chrome plated stand to take up less space. Unbreakable and dishwasher proof. NB. Baskets and stand are sold individually. Oblong Basket dimensions: L32 x W26cm. Stand dimensions: L46 x W24cm 18-21cm high. Perfect for breakfast as it save space. Useful for displaying a variety of items. Being washable is essential. As we are just a small BnB a smaller basket would be good as well. Adds a touch of professionalism to my breakfast bar. Perfect, ideal for displaying home baked breads and scones. Basket looks to be straw but it is actually plastic which is ideal for wear and tear, looks like new all the time.